This happens on the bridge EVERY. SINGLE. DAY. Location: Not on ^ that bridge ^, I'll tell ya that much. Hey, all. Work on the final check-through of my other project is still ongoing, so in the meantime, allow me to show off some of the other things I've done when I've had enough of looking at dialogue and manipulating code for a while. Looking at the ever-neglected cult classic class, I went and edited the melee-range animations for the GBA Soldier. So now you can have smoother frames and witness an infantryman's impression of a marching band drum major/majorette...except it's much more lethal. The frames for throwing Javelins are still under construction. The lance-twirling comes from the original javelin-throwing frames, some of the leg positioning from other frames, and the *shing* effect was inspired by The Blind Archer's Halberdier v2. But other than that, everything else is either the original material or custom-made by yours truly. This set of animations has NOT been tested in or prepared for FEditor or any other sprite-based romhack tool. These are raw .gifs. I will update this thread when I feel I have something to show, so posts could be frequent, sporadic, or something in-between. I hope you'll produce more! But that's not your fault, its IS'. Your work is a nice tweak/update to the animation. Anyways, look forward to seeing more. From a strictly logical/spatial stand point, I think the spin would make sense the other way. It's also awkward how much the soldier takes tiny steps instead of just stepping back for power like the general does. I tried doing it counter-clockwise, but that seemed even more off to me. But I do admit I may have went a bit overboard with the amount of steps. Perhaps I'll limit it to one or two with the next revision. 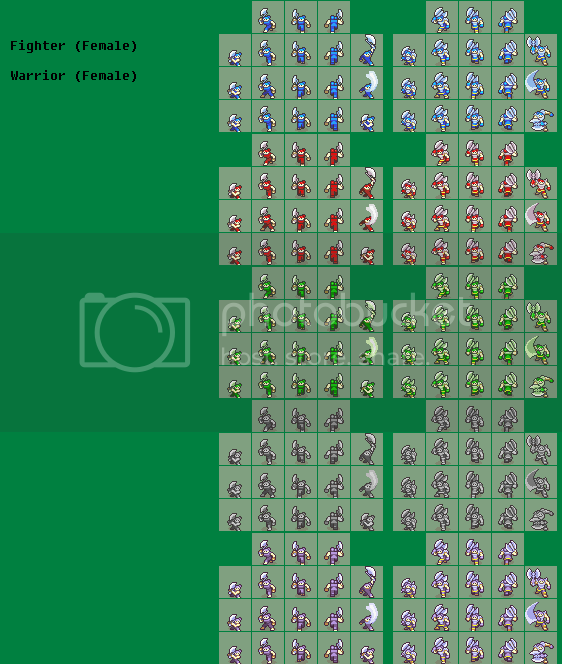 Map sprites for those who have female Fighters and Warriors in your GBA hacks. There's probably lots of different versions of the same concept, but well, here's mine. These are based off of the original male Fighter and Warrior map sprites. Why the hair bun? It was simple, it was kinda cute. And now for something rather silly. This is the result of what was sort of a challenge: a GBA version of FE9's "The Atonement" map. There are a fair number of custom tiles on this thing, and they all aren't as obvious as the pretentious "monocled Aion clone" portrait on the rug there. The columns in the lower half of the map are meant to be Braces within the terrain data, not Pillars. Other than that, the grand majority of the tiles come from FE6's "Bern Keep" tileset. All in all, I tried to stay faithful to the original source's structure, but the 3D-to-2D transition brought in a couple hiccups, and in order to keep the floors distinct from one another, I had to add another horizontal row to the ground floor. A consequence of this decision is the fact you also now need Longbows and other three-range weapons to attack through the horizontal walls in the lower half of the map. I doubt hardly anyone took advantage of this in PoR though, except maybe to kill the Priest in the bypass corridor. WTF is up with that Aion carpet? There's a few stray tile goofs, like the corner to the left of the big door. Also, I think it would help to even the chest rooms out more by spacing the chests further apart. Otherwise, everything is concentrated in the center of the rooms leaving the corners barren and lonely. It was the result of a discussion with the guy who issued the challenge. We were brainstorming along the lines of, "if this isn't gonna be Tanas Manor, who owns the place?" 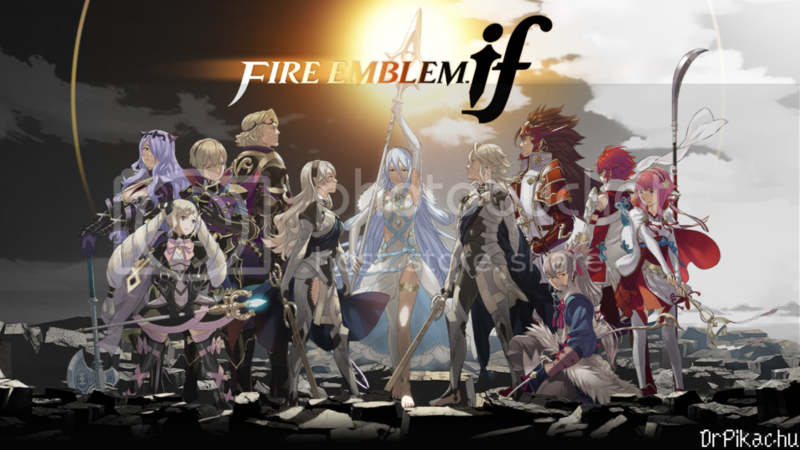 After browsing through the portraits for FE6-8, we decided on Aion. Just Aion wasn't enough, however. So we went farther and gave him a monocle. ...And put his mug over the big Bern dragon emblem tiles. And there you have it. This manse belongs to more or less the Fire Emblem equivalent of Col. Klink from Hogan's Heroes; this guy just has more hair. The chests are positioned just like how they were in FE9. Like I said, this is meant to be as faithful to the source material as possible but with GBA graphics. You do raise a good point, though. Perhaps I'll release a "woolsey-fied" version of this map sometime in the future. If you have any suggestions, fire away! As for that corner, duly noted. Can you highlight the other errors? well played monocle aion, well played. About the door: It's a little taller than the walls, which doesn't quite make sense. A door sits within a frame, so the frame should be taller than the door. This can be fixed by using columns on either side of the door. About the wall on the left: You're using shaded wall tiles when there's nothing to create the shadow. 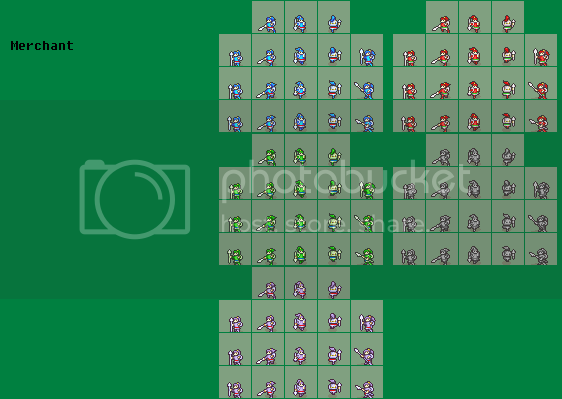 I haven't used this tileset in a while but, if I remember right, options are limited. For corners like this, it's best to use a column. The other stuff is minor 1 tile fixes. I applied the fixes you suggested (and a few others I noticed in hindsight). It has been a while since I last worked on the map, and yes, the options are pretty limited. So...I cheated and spliced bits and pieces together to recreate that section of wall. I did the same with the corner to the left of the big door and to the right. Like you said, a column could have worked, but I suppose I was just too stubborn. That left banner would have posed problems if I put a column in there, anyway. Oh, and those weird gaps in the shading in the lower left are there for a reason: there were windows on that wall in FE9; rotating this map so the western wall faces the camera would show windows matching those shading gaps as well. green being tile errors(although I just looked at fe8's version and they used what you did, but fe6 didn't, so idk; fe6's looks better to me). I fixed the shading errors. Those ones on the bottom left aren't errors, though. I explain why in an earlier post. 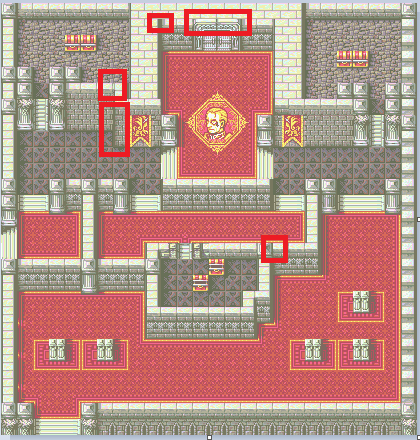 I went and looked back at FE6's "An Undying Dream" and the tileset I have of that map, and it seems that particular set of tiles works in sets of twos, because that is the most I see in a row. FE8's "Father and Son" changes that "rule", like you said, and it looks about the same there as it does on here. It looks a bit strange, but barring replacement of those tiles with the more simple stone-only layout, I'm not sure how else to fix it outside of more custom tiles. Still, all the advice has certainly spruced this map up so far, so props for that. oh I missed this part, okay. and yeah idk on the walls, I don't think it really matters if you add custom tiles since you already did, but that's up to you. I hope to have it done soon! Huh... Is a female Soldier? ..
Or a female thief with spears? No, that's Anna, of the Merchant class, from FE:A.
:2 That's really awesome. On the first selection frame, though, the sheer amount of solid red looks kind of weird to me. Intentional? There's only one shade of red in the player palette. I'd suggest maybe making the backpack 1 pixel taller and perhaps making it a more distinctive colour (i.e. brown), only because until you pointed out it was Anna I thought it was a weird curvy arm. Finished a full prototype set just minutes ago. As a few of you have correctly guessed, this is supposed to be the Merchant class as seen in Fire Emblem: Awakening, adapted for GBA FE romhack use. Battle sprites not included. Bits and pieces were borrowed from the female Myrmidon (mostly the hair, because of the ponytail) and the female Archer (legs), but the rest of it is custom-made and based on the FE:A Merchant map sprites. In return for making you guys wait, here's something I put together on April Fool's Day. Yeah, I know there's probably tons like these all over, but oh well. I still like it, and maybe you will too. These are set for 1366x768 and similar ratios. So yeah, we're basically going full Anna with this one. This is a male version of the Merchant, with the head based off of the GBA Fighter to match the Archanean Jake's look. The overcoat has been changed as well to look less feminine, and the feet follow the same "rules" as the Archer classes.